On the 1st of November a brave team will experience the adventure of a lifetime as they climb Mount Kilimanjaro to raise funds and awareness for prostate cancer. Among them will be Kate McInerny, a keen traveller who lost her father Frank to prostate cancer in December 2013. We had the pleasure of interviewing Kate to hear all about her story, experience so far and motivations. Why are you taking on this challenge? It was a matter of fate really. I love travelling and I’ve travelled all over the world and done a lot of hiking. I wanted to go on another trip but I wanted to do something that had meaning and wasn’t just a holiday. So I sent off a request to Inspired Adventures. I saw that they did charitable hikes, so I asked which ones they had coming up. Then at the end of last year my dad got quite sick and ended up passing away. Inspired Adventures contacted me the day after and said they were doing a fundraising hike up Kilimanjaro for the Prostate Cancer Foundation of Australia and that it was leaving the day after my dad’s birthday. So I signed up straight away, I was the first person to sign up for the trip, and I’ve been actively fundraising since that point. That’s the first reason I am doing it – in honour of my dad. He was a big personality and a strong character, he was also very big on community awareness support and research. The second reason is that I will hopefully put in motion a change in behaviour in the people I have contacted or who have attended my fundraising events. I think there needs to be a bigger voice for men’s health. There’s not many people out there actively trying to raise awareness for men’s health issues. Not just prostate cancer but for any male related cancer. Not talking about it has such a damaging effect and there just needs to be more of an active awareness for it. The sad thing about prostate cancer is that if it is detected early it can be entirely curable. The problem is that a lot of people just don’t go and get checked up and they miss that opportunity. I’ve never done anything of this magnitude. The closest I got was climbing to Everest Base Camp with my sister in 2012. But that’s still nearly a kilometre short from what I’m doing on this trip which is by far the biggest physical challenge I have done in my life. But climbing a mountain is not nearly as hard as going through cancer, that’s for sure. There’s a lot of training in it I would imagine? Yes, a lot of training and a lot of mental preparation. I go to the gym nearly 5 times a week! I’ve also got trainers helping me to get prepared because you’re not only climbing the mountain but you are carrying the equipment you need to get you to the top. It’s a difficult challenge physically and then there’s the emotional aspect of it too – that when you reach the top of the mountain you’ve made it, you’ll have the elation of being up there, but you will also be reminded of the reason you are there…so, it’s a bit sad, but it’s good we are going with a good group of people that all have the same experience. Yeah, definitely. When you reach those walls walking up the mountain you need someone there to keep coaxing you along, and you need to provide that support to someone else too. So it’s good, it makes it a bit more of a family affair. How has your team fundraising for prostate cancer awareness been going? There’s 6 of us doing the challenge for the Prostate Cancer Foundation and we have a number of prostate cancer survivors that are also climbing the mountain with us. But as a team our fundraising is going fairly well, I think we’re nearly at $50,000. We’ve had a few successful events and a few corporate sponsors that have helped us along the way. So there’s definitely support out there. Haha, yes I’ve had some morning tea events at my work which have been quite good. I work for the Melbourne City Council. But I’ve also just last night hosted a trivia event at Hotel Kew which was quite successful – we had 100 people there and it sold out prior to the event. We’re just tallying up the dollars today and we’re hoping it’s in excess of $3000-4000 so we’re pretty happy! We’ve had a lot of great sponsors provide us with auction items and Quizmeisters did the trivia – they were fabulous, everyone had a really good time. Other than that though, we‘ve done a pre-loved clothing market and I’m going to be doing a basketball naming rights game at the Bendigo Basketball Association on August 9. They’ve dedicated a game specifically to the Save A Man Challenge and there’ll be a raffle and collections happening too. The Bendigo Basketball Association has been really generous in setting that up for me. One of my team mates over in Western Australia hosted a poker night recently which was quite successful too. So we’re coming up with some fairly unique ideas. 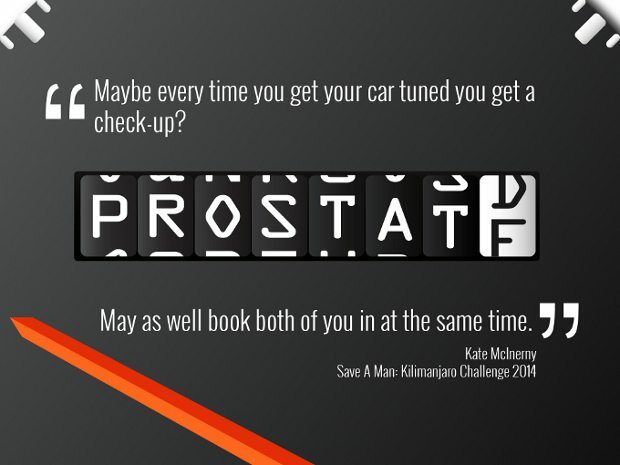 What do you think are some of the best ways people can get involved in spreading awareness for prostate cancer on an everyday basis? I think the best way to spread awareness is to tell all the men in your life to go and get checked. It is such a simple way of keeping an eye on it. Having a regular checkup is such a simple step but it can make a huge difference and save a life. But anything like this, any kind of behavioural change can take a while, so just more reminding the men in your life that you need to make it a regular thing – like going to the dentist or getting your car tuned. Maybe every time you get your car tuned you get a check-up, it’s something you need to do. May as well book both of you in at the same time. And it costs a lot less than the car, I can tell you that!